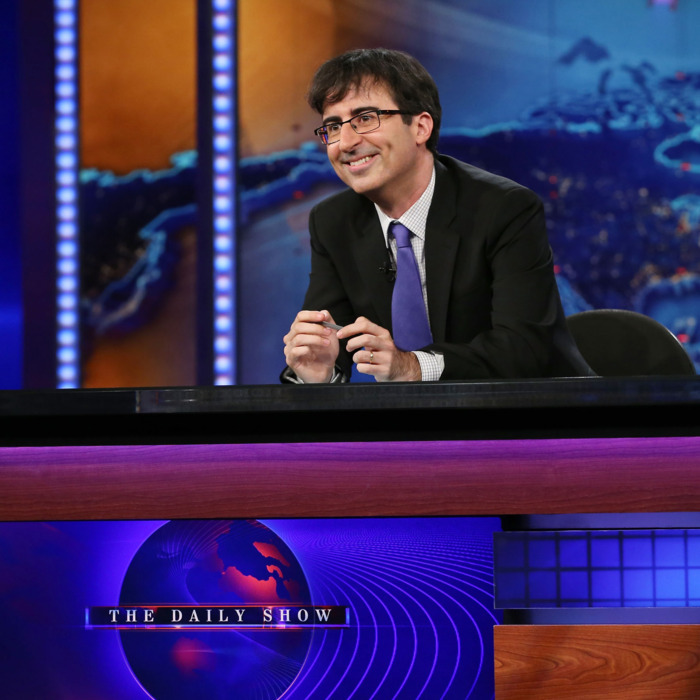 Since he began guest-hosting The Daily Show for Jon Stewart three months ago, John Oliver has started every episode with a different joke about where his boss is. Like last night’s: “I’m still sitting in for Jon Stewart, who’s been spending the entire summer at training camp with the New York Giants. Apparently, he’s extremely happy and in almost constant pain.” Besides being consistently funny, these little nods to Stewart, who is away directing a movie in Jordan, reminds the audience, “I’m just keeping the seat warm.” It’s a savvy move, framing his presence behind the desk as a pleasant interim rather than the kind of permanent shoe-filling that would make devotees far more judgmental. As he’s about to wrap up his last week as guest host, Oliver hasn’t acted like this summer is an audition for him to take over The Daily Show if/when Stewart steps down — which is why it will be so much easier when he does some day. That and the fact that John Oliver has turned out to be fantastic at the job. Oliver is able to precisely weave in and out of each joke, deftly giving the laughs just enough time before confidently getting back into it. He’s a bit goofier (the whole Carlos Danger thing was gold for him) and younger than Stewart, which helps the show avoid the cynicism that occasionally comes with satire. And he’s shown himself adept at the myriad roles the gig demands: pulling back on the comedy to make a serious point, operating as a straight man to the correspondents, and conveying genuine pathos when the story calls for it. Interviews were a struggle at first, which Oliver admittedly expected, telling Charlie Rose, “Having a human conversation is not something I’ve had any training in either as a comedian or as, you know, a human being.” Sure, he’s no Johnny Carson, but he’s become solid. Last week, he was able to both wrangle fun out of the brick wall that was Liam Hemsworth and have a particularly powerful conversation about sexual assault in the military with Senator Kirsten Gillibrand. Oliver repeatedly jokes about destroying (or breaking) the show, but the ratings have been steady, with a slight drop attributable to the usually slower summer season. Fans are staying loyal, and not just because they already set their DVR season pass and figure they should just leave it on until Stewart comes back: They like Oliver. And now he is set up perfectly to take over, should Jon Stewart decide to move on. This is not to say definitively that Stewart has plans to leave, or should leave. The show is as lauded as ever, and Oliver’s smooth transition can partially be credited to the resoluteness of Stewart’s vision. Last year, Stewart renewed his contract through the middle of 2015, and by that point, he will have hosted the show for just about sixteen years, or four presidential elections. The fact that he took the summer off to film a movie that he also wrote — a drama, no less — does indicate some creative restlessness, though maybe this project will be a palate cleanser that will keep him going another sixteen years. But let’s say Stewart decides not to renew his contract and steps down from the show. If Oliver was given his job without ever having guest-hosted, there would be much more harsh judgment and scrutiny. The late-night-host changing of the guard (much like the changing of the network news anchor) is not the seismic cultural shift it used to be, but The Daily Show is the one late-night show where a new host really still matters: People really care about The Daily Show — it’s arguably the most respected late-night institution, and the only one that feels imperative to watch nightly for its sharp spin on the news, rather than assuming that if something funny happens you’ll be alerted the next day on YouTube. Stewart made it that way and defines the show. So if he were to leave with no immediate heir apparent, people would set an incredibly high bar for who should take over. Those correspondents already on the show would be taken for granted; they might not seem big enough for such a pulpit — no, this would have to be a job for someone who had established him or herself as a political-comedy star. Marc Maron? Janeane Garofalo? W. Kamau Bell? Colbert is entrenched in his own, different kind of show, so there would be none of the “move Letterman up!” fervor that followed Carson’s retirement, but the expectations would be so high that unrealistic demands would be made: This is a job for Louis C.K.! If the seat then went to an untried Oliver, fans would scrutinize his entrance far more skeptically, even if he displayed the same talents he’s displaying now. He’s a correspondent — he’s better out in the field or talking to Jon via green screen! But now we know he can do it, making Stewart’s eventual departure far less fraught: There is someone on deck who can do the job. It’s the difference between “proven talent” and “prove it, talent!” The Daily Show has done the perfect job in preparing us for a changeover. They’ve even made it easy by giving us a host with the same first name.